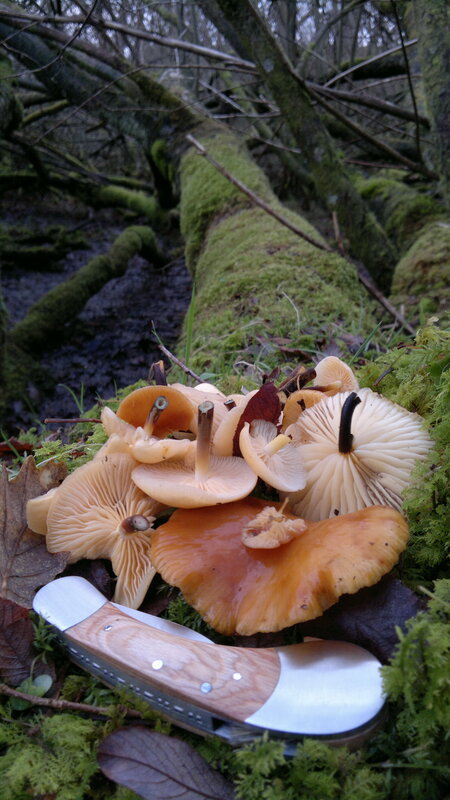 During January also look out for winter chanterelles, oyster mushrooms, blewits, jelly ear, rosehips, sea radish, sea beet, hairy bitercress, shellfish, yarow, sea kale, sorrel, wood sorrel, reedmace shoots/rhizomes, bog myrtle buds, dandelion. 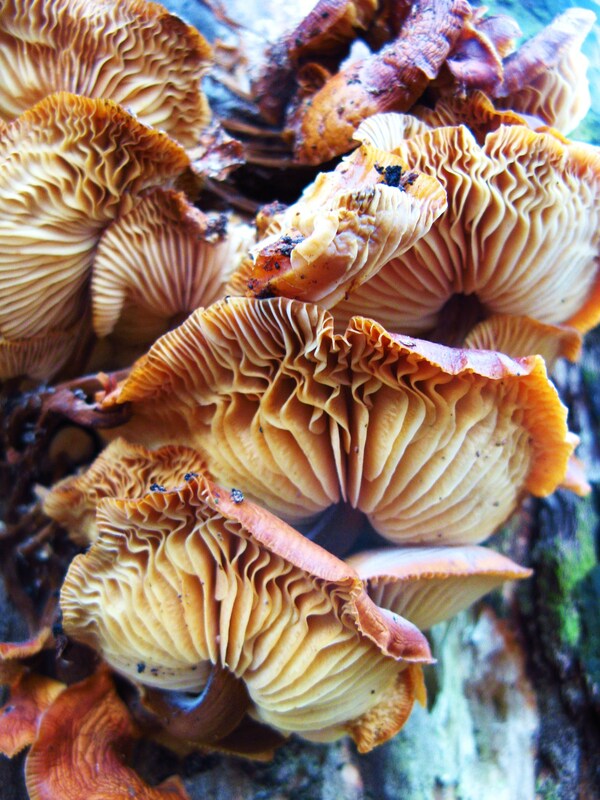 Edibility – 4/5 – Very tasty mushrooms, with a sweet, mealy flavour. Young, dry buttons are very tasty indeed. Habitat – On most species of dead or dying fallen or standing deciduous trees – especially elm, oak, ash and willow. Also on gorse bushes. 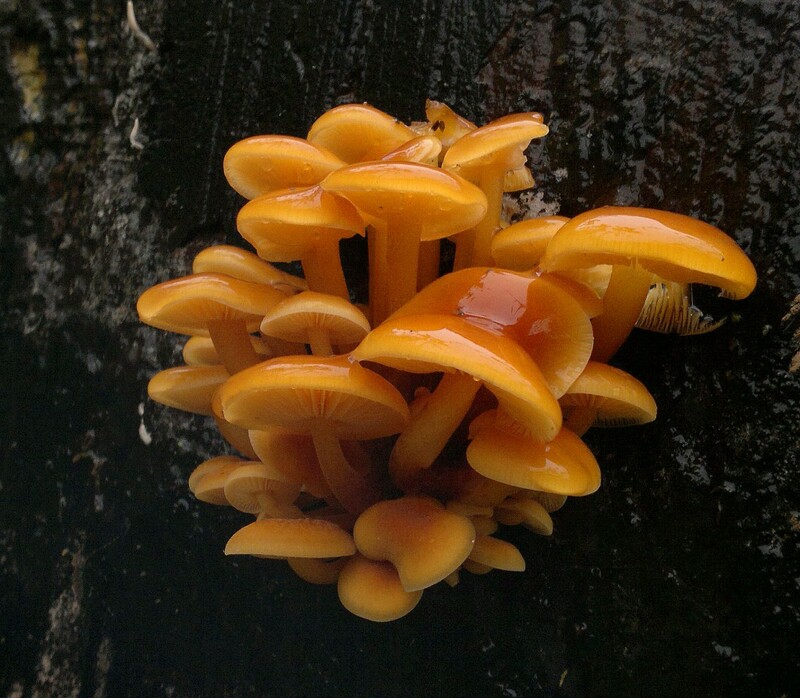 In bleak midwinter, when mycophogists start to look hungry and haunted by the paucity of pickings, velvet shank (Flammulina velutipes) can put a glint back in their eye. 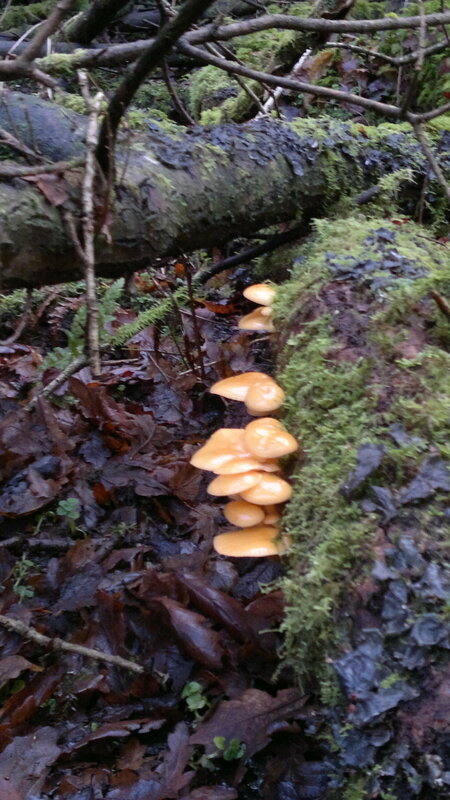 It grows between November and March, when, in Scotland, there are very few other mushrooms about. This alone could warrant celebrity status – even if it made poor eating compared to its less hardy autumnal relatives. But these pretty little mushrooms can hold their heads high in gastronomic circles and, in my opinion, deserve a place near, if not at, the top fungi table with more celebrated species. I try not to rank different species: comparing the floral bouqet of a chanterelle in August to the mealy taste of a velvet shank in January is like scoring elderflower champagne against sloe gin. Both are tastes of their distinct season and should be celebrated as such. Of course personal preference comes into it too. What velvet shank gives is a pleasingly slippery yet firm texture and sweet, mealy flavour that works extremely well in game casserolles and with my favourite winter stew, oxtails. A load of velvet shank and a cheap cut of meat in Ole Slowy (my trusty slow-cooker) before a day in the hills makes for a perfect homecoming. Young, dry buttons are also exceptionally good raw – very sweet and aromatic. My friend Alison thinks they taste like toffee! If you are new to foraging for fungi, and get a bit overwhelmed by the myriad different autumn varieties, being about the only mushroom in the winter forest makes velvet shank quite an attractive quarry. That isn’t to say you can be complacent: “Little Brown Mushrooms” (the mycologists equivalent of ornithologists “Little Brown Jobs” or L.B.J.’s) are notoriously hard to tell apart and include some poisonous species. Most notable among these is the funeral bell (galerina marginata) which is deadly poisonous. Although it is an autumn mushroom and should be long gone by January, its season may overlap with velvet shank in a mild winter – especially November. 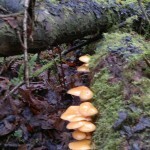 Familiarise yourself with it, and the sulphur tuft. If you see any sign of a ring on the stipe, and a spore print is not white, then you are not holding a velvet shank. 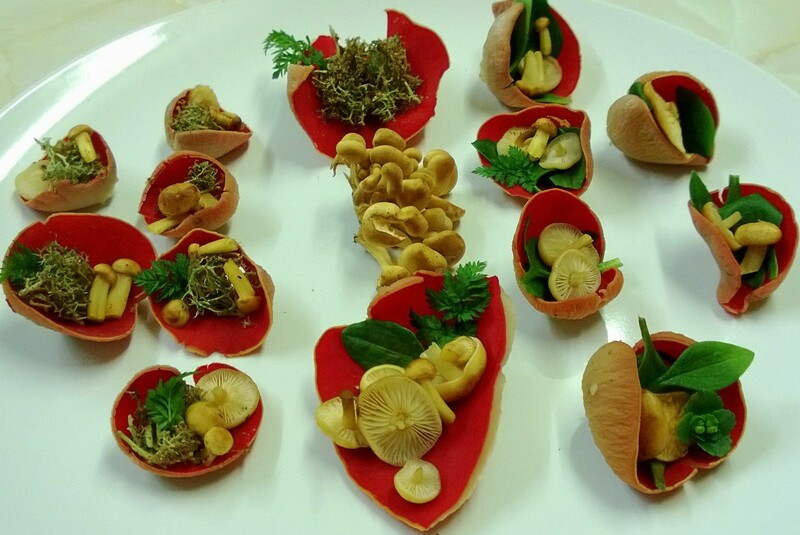 Please don’t be put off though, these are lovely and distinctive mushrooms. They are saprophytes, meaning they break down dead matter, though I suspect they edge into parasitism as I find most of mine on dwindling, but not dead, deciduous trees. They will grow in dense, overlapping clusters on many species of tree, but in my experience prefer elm, oak, ash and willow. My best hauls have come from a patch of mossy ash trees that are sinking at jaunty angles into a swamp. This makes for quite exciting picking – balancing on slippy fallen trunks and squirming round boughs like some giant game of twister. 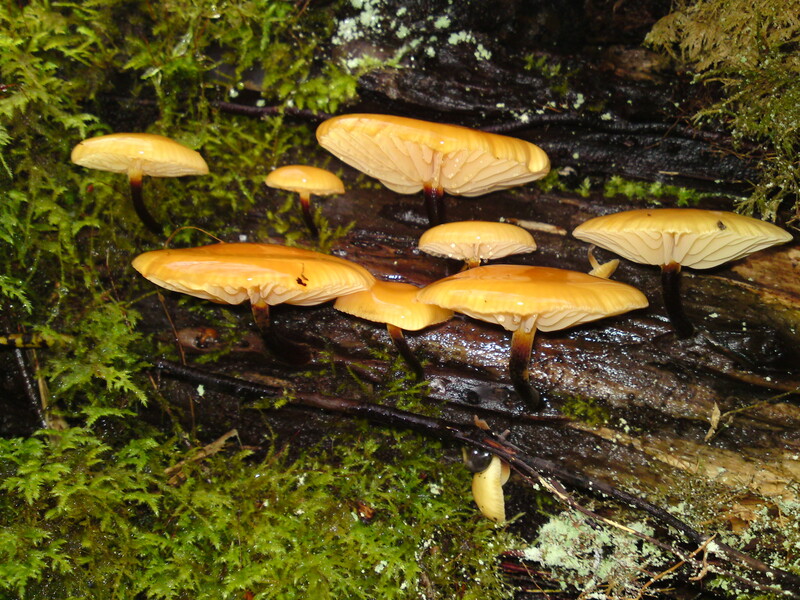 Their clusters of caramel to orange coloured caps are normally quite easy to spot from a distance among the mossy greens and deep browns of winter. In wet weather they will glisten with slime, but don’t be squeamish, this can be easily dried or wiped off. The key to identification is the ringless velvety stipe that give it its rather lovely name. Other names – velvet foot and winter mushroom lack both poetry and and precision. 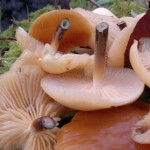 The tough, fibrous stem is usually curved – ensuring that their pale yellow gills are perpendicular to the ground, allowing spores the best possible chance of success. It starts off pale but soon matures to deep brown/black and develops a sumptuous velvet coat. If you require further reassurance, check that the cut stem shows a pale cylinder inside the dark outer. You may well have eaten velvet shank without knowing it. 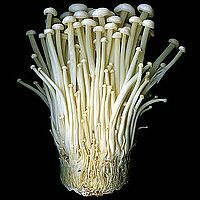 The japanese cultivated mushroom enoki – or more accurately enoketake – is genetically identical. It is grown on logs and compacted sawdust in the dark, resulting in straight, tender stems and a pallid complexion. 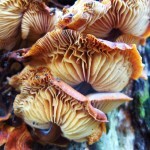 Occasionally you can find wild velvet shank developing beneath the bark of trees in a similar manner. I am pretty scathing of this pale imitation – it makes me think of the freak, mutated salmon that result from intensive farming. For a proper rant on this, check out this blog. If you pick some of the real article, remove the stipes of older specimens – they are usually too fibrous. Wipe or scrape the caps free of slime and brush clean (don’t wash – you will only make them swell with water and go slimier). Alternatively lay them out in the fridge for a day or two and they will dry out a little. I suspect fresh, clean caps can be successfully frozen if you get a glut, but have never resisted eating them for long enough to find out. They withstand snow and very low temperatures in the wild (infact thawing actively stimulates spore production), so why not at home? They also preserve well in vinegar and oil. Simple sauteing with garlic and winter herbs such as cow parsley is delicious. Sharper flavours such as bittercress, sea radish or wood sorrel can work well against their malty sweetness. But tucking them up in Ole Slowy – my trusted slow cooker – with some oxtails is my favourite winter warming treat. I had some of the enoketake on a burger on MYE, pretty pointless but I’m finding lots of wild ones down here now (North Notts/South Yorkshire border). 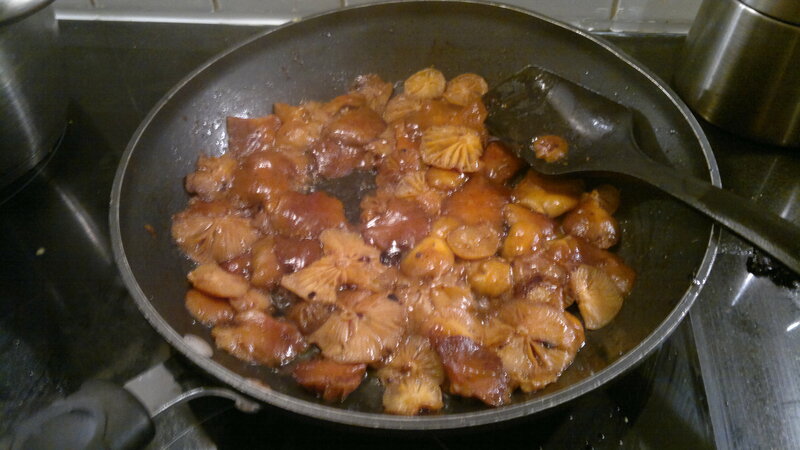 As someone told me dehydrating the Velvet Shanks wasn’t really worth it. I now have a surfeit so I’ll have some in an omelette now the sautee and freeze some and just freeze the remainder. I’ll report back. The omlette had a couple of Blewits in it too, it was lovely.